Another Red Sox game...and yet ANOTHER bad performance by a starting pitcher. This time, it was Rick Porcello's turn. Despite handed a 3-0 lead before even taking the mound, the Red Sox righty couldn't get out of the third inning as Boston closed out the weekend series with the Mariners losing 10-8 at T-Moblie Park. Porcello was charged with nine runs (only four earned) on six hits and a quartet of walks over 2.2 innings while striking out three. J.D. 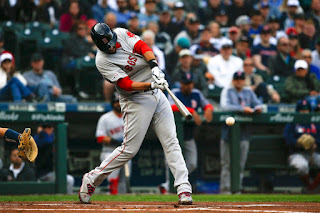 Martinez (pictured) delivered an RBI single in the opening frame, followed by Eduardo Nunez who plated two more with a single in the top of the first. Seattle answered back with two in the second and then broke the game open in the third scoring seven times. The Red Sox managed to narrow the gap with three runs in the fourth on a J.D. three-run homer (his 1000th career hit), and they scored once in the ninth courtesy of four walks, but ultimately fell short. Brian Johnson allowed two inherited runners to score and another was charged to him, but Brandon Workman, Colten Brewer, and Ryan Brasier each threw an inning of scoreless relief. We're on to Oakland and David Price on Monday in an attempt to turn this mess around.